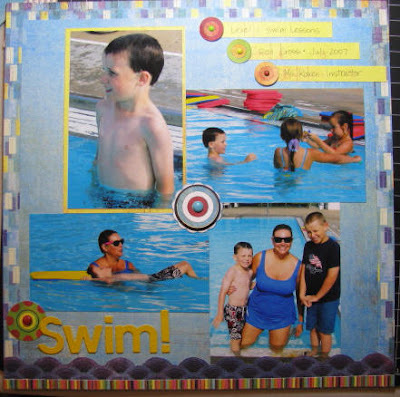 Personal Scrapper is challenging everyone to complete a LayOut A Day (LOAD) in June. Every day a member posts a challenge. The challenge is just to scrap, but encouraging everyone to try to finish 30 layouts. If you complete all the challenges, you'll win something. I can be bribed! Erica, the owner, posted the first challenge: scrap something that makes you Happy. I had these photos out on my desk to scrap with Cosmo Cricket's "Snorkel" line. The story the photos tell make me more than happy - they make me laugh. The colors in the papers are also my happy colors. 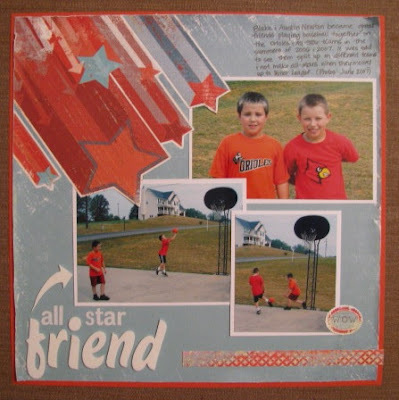 PS member Addie posted a LO by Kelly Goree and challenged us to Scraplift the layout. I stretched the single page LO into two pages to fit my photos. Again, I used the "Snorkel" paperline. The What's Missing challenge was posted by PS member Emma. You were supposed to scrap something you miss. 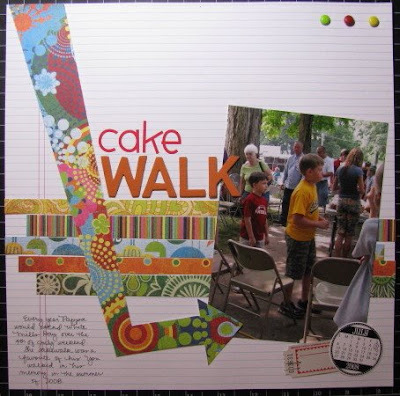 I decided to use a photo of the boys from last summer at a community festival doing the cake walk. Every summer Pappa would attend and he loved the cake walk. I miss Pappa. It's hard to believe he's been gone for two years now. I scraplifted a layout by Shannon Zickel in the new M/J issue of Scrapbooks, Etc. magazine. 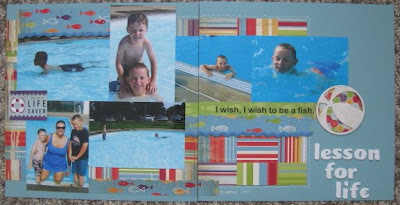 They could complete a LO using 6 different patterned papers and 4 photos like I did on "Swim". I used the Basic Grey "Lime Rickey" line. They could complete a LO using 6 photos and 4 patterned papers. Since it was my challenge, I did it both ways. I made this 2-page LO using the WRMK "MVP" paper line. 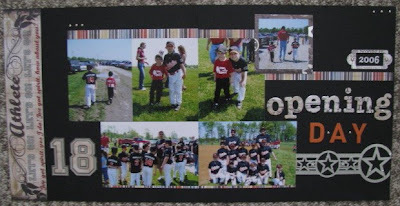 These photos are from Blake's first season of Rookie league when he was Kevin's age! Lucky me (and you...for your viewing pleasure!) 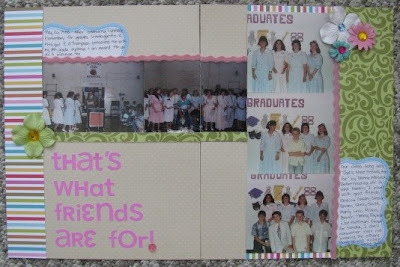 I had snapshots from my 8th Grade Graduation!!! My boys got a good laugh when they saw these photos! The title came from the Dionne Warwick song that we sang that day. I used Bella Boulevard papers. Lindsey/blondegrrlie challenged us to create a LO using at least one black/white photo and one color. I am trying to complete all the challenges this month without having to take/print photos for them. So, I went through my boxes of photos to find a b/w shot to get me started. I came across this shot of Kevin that I had a duplicated of printed in b/w for the sole purpose of telling this story. I'd just never gotten around to it! I didn't have any color pics that went with the photo, so I found random color shots of me and Tom to go along with the story. 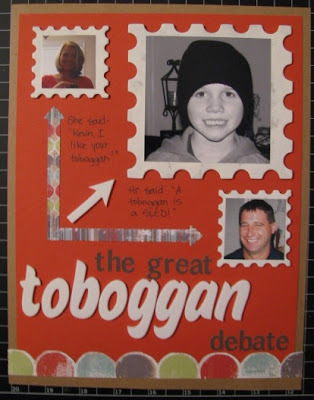 In my world, a toboggan is a HAT you wear in the winter. In Tom's world, it's a sled. I don't care what Webster's says it is! It's hard to believe that Tom only grew up two hours slightly northwest of here and that we have a "language barrier"! 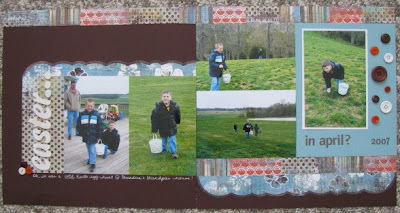 I used the new June Personal Scrapper kit for this challenge. My good friend Mel/mc3mom posted a great challenge to use a PageMaps sketch. Again, I used the "Snorkel" line. Emma was back today to post another challenge. This time we were supposed to scrap about a Friend. I decided to use one of Blake's friendships for my topic. I used the June PS kit for this one. I have one extra layout to add here for the week. I was excited to receive my new June kit on Friday and couldn't wait to make a LO with it even if it didn't fit into a challenge. I used a PageMaps sketch from January for this Easter page. I'm looking forward to seeing what challenges come next! beautiful layouts so far Amy! !